My calendar tells me my dear friend Spring will be here in 18 days and, technically, be here three months. But I live in Kentucky, so I know it will feel like Spring’s visit is cut short. Another sign of Spring’s coming arrival: Murray’s old-fashioned, walk-up Dairy Queen that is open from March 1 to Oct. 31 opened yesterday. I’ve lived in Murray for 11 1/2 years, and yesterday was the first time I’ve ever been to Opening Day. Probably because I don’t want to wait in line for ice cream when I can just get is quicker the next day or the next week or the coming several months. But when I drove by yesterday, the line wasn’t nuts. So I stopped and treated my kids to Dairy Queen. Cate got a cherry Dilly Bar [which caused her to stumble over her words, which made me grin at the cuteness] and Ben got his first DQ cone, a baby-sized one, which he promptly devoured. And then he mooched bites of his sister’s. Yes, it’s nice of her to share. Now I’m hoping Spring will be just has giving with warm-but-not-humid temperatures and plenty of sunshine before Summer rushes my friend away. So you have your Sycamore Street dining room table as your table now? I love that table. 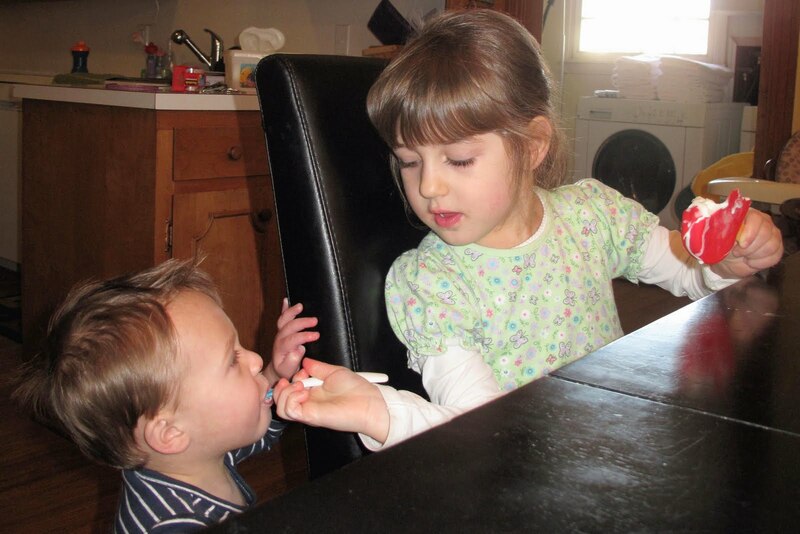 That's adorable…Cate feeding Ben ice cream!